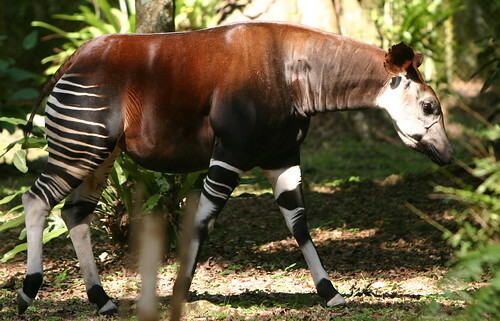 An Okapi of the Ituri Forest. Photo by Kim Gjerstad. Our entry to the Ituri Forest was not brilliant. Sarah was ill in Kinshasa (an earache) and then again in Kisangani (diarrhea). I, too, suffered from untreated drinking water. Un-dampable, John continued to meet people and cut deals, but John and I both felt relief as we turned onto the dirt track leading east out of Kisangani. We were on our way to a place that would be home, although -no denying it – I felt a twist of anxiety. Was our research doable? Would Sarah be happy? I held Sarah tightly on my lap. John sang out loud phrases of a song he often repeated from the southern Ituri. Sarah chimed in: “Benoue. Balingi batuli banoue. Benoue.” John said that it meant something about being hungry while others ate. The tune was jolly and we followed it with “Old MacDonald”, and then “Frère Jacques”. The clusters of mud houses narrowed down to a single line on either side of the road, and then the spaces grew between the houses and were filled with gardens of corn and cassava. People turned to look. Children shouted and waved. 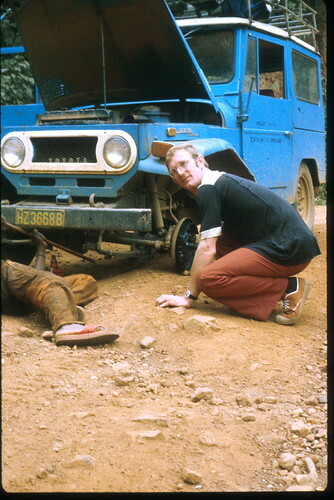 John overseeing road repairs of rebuilt blue Landcruiser. John relaxed a bit, getting the feel for the twenty year-old LandCruiser, with its short wheel-base. The Belgian mechanic who had rebuilt the engine repainted the body a pure blue, the blue of a tropical sky. Clouds billowed behind from the dust-thick dry-season track leading into the forest. John pointed beyond a new garden where regrowth had been felled, to a dark line of trees. The forest. It had seemed so far away while we were in Kisangani. We had spent a month first in the capital Kinshasa, getting permits, and then two weeks in Kisangani buying minimal supplies and getting this old car. The flight east from Kinshasa to Kisangani had been over forest as unbroken as the sky above except for the single line of the Congo River. We followed that line for three hours. From the air, Kisangani was a hole cut into the trees on a bend of the River. Once on the ground the forest disappeared behind houses, people and dusty bustle. Now driving east from the bend in the river, the forest seemed to crawl closer extinguishing dust and rush. We bounced. We jolted. Somehow the car did not seem to slow down before the holes or gaping erosion scars. Uphill, on the other hand, the car gasped ever more slowly. The longer the hill, the more its lungs rattled until finally, at the top, it would breathe again. John said he had been told that the road was smooth and impeccably maintained during the colonial era. Through villages, chickens ran before us, flew up in terror. Goats that had been soaking up the sun in the middle of the road reluctantly hove up, front legs first, bleating their objection. They scampered to the side as our blue demon bore down. Chickens were more random in their flight. One turned the wrong way. Cluck, cluck, Thwaap! Feathers flew. The villagers started up from mid-day occupations. The mother pounding sombe at her pestle. The woman plaiting the hair of another into neat furrows. The men sitting by the hearth at the barazza. They stood up, yelling, arms raised. John kept going. He frowned; glad that just there the road had no uncompromising uphill. “It OK?,” Sarah asked, her hands on the dashboard and her blue eyes fixed in consternation on the show of village solidarity. “They’ll eat it , won’t they?,” I asked. John did not say anything until we were well beyond the village. The land flattened. We saw what was immediately before us, tall oil palms beyond small mud and leaf-thatch homes, a densely overgrown rubber plantation, riotous regrowth on old garden sites. The forest, when it appeared, stood, dark, slow and infinite, so much older than this slender ribbon of settlements across its girth. Its deep greens were remote from the research projects planned in our Michigan labs. We, too, in the month and a half of tropical sun and waiting-room mornings had lost a bit of graduate student ardor. Ostensibly the projects would make the inscrutable comprehensible. But the forest was fundamentally unconcerned. We were headed east towards Epulu where John stopped briefly in 1973. Epulu was on this “main” road, a road traced in bold on our Michelin map; in our proposals we argued that its accessibility made Epulu appropriate for dissertation projects. To our families we described it as an appropriate place to be with Sarah. It became clear as we crawled closer, that we overstated its merits. Small vehicles like ours were rare and a road in such condition would not even appear on a county map in the USA. But there were other reasons for choosing Epulu. In the 1950s, the colonial government captured and kept okapi at Epulu. 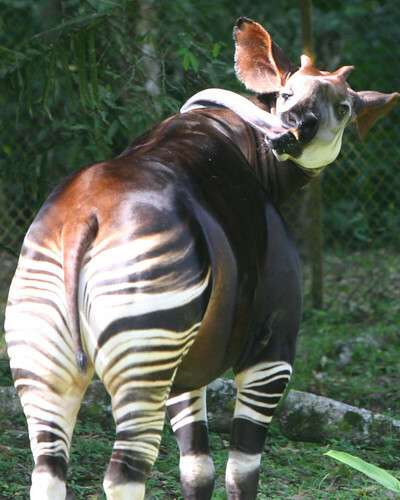 Okapi are rain forest giraffe, the size of small horses. Mainly a velvet brown/black, they have zebra stripes on their legs, large gentle eyes and long giraffe tongues that strip foliage into their mouths. Zoos were eager to add them to their collections. Only known from northeastern Zaire, with only one capture Station, Epulu, the okapi gave the Ituri Forest international recognition. Okapi cleaning itself with it’s giraffe tongue. After independence the Okapi Capture Station was taken over by the Zaïrian Park’s Institute (Institut Zairois pour la Conservation de la Nature – IZCN); it was IZCN that gave us official permission to work in Zaire. The forest surrounding Epulu was not a protected area, but there was a Park warden and a handful of guards. In Kinshasa, IZCN told us they would announce our arrival by HMF radio. Epulu had another historical relevance. It was here Colin Turnbull had his inspiration. He had first come as a young man, open to any and all experience. At that time, the name on the map was Camp Putnam, not Epulu. There was no Okapi Capture Station, and the bridge across the Epulu River was new, just constructed from American World War II army surplus. Would we find the Mbuti of the central Ituri as Turnbull had described them, more independent of villagers than John had found further south? Was the Epulu forest all-providing for self-reliant Mbuti whose rakish defiance Turnbull deemed typical? Would they appear, arms crossed, at the village/forest border? We were150 km from Kisangani when one rear tire went flat. A nail on the road. Bad luck. But that persistent grip of anxiety immediately brought to mind superstitions learned in Peace Corps: killing a chicken without permission of its owner brought punishment. At 215 km, the spare tire also blew out. This was truly punishment. We slowed and stopped in front of an old, abandoned coffee plantation. We had wrenches, patches, glue, jack and a pump but no tire irons. A crowd of onlookers gathered. One man grasped the problem immediately. He helped John place the jack and started levering as though he had done it many times before. John asked a series of questions as they wrestled the wheel, and tried various substitutes for the missing tire irons. The barefoot man in a dingy ragged shirt had been the plantation mechanic. A vociferous troop of helpers thrust, hammered and pried makeshift irons into place. With the inappropriate tools, they punctured another hole in one of the inner tubes, but we felt our problem was in good hands. In the meantime Sarah was surrounded by curious youngsters. As in Kinshasa and Kisangani, she was a bit afraid of the fascination she kindled, but at the same time eager to please, eager to make friends. Holding my skirt with one hand, she drew with a stick in the dust with the other. A particularly bold lad, at least twice Sarah’s age, grabbed another stick and matched her hieroglyphics, exchanged smiles and received the approval of his friends. Surveying the crowd I noticed that there were still no Mbuti Pygmies. John, never taking his eyes off the tire operations, told me that there were none in this part of the forest. They would appear only further east, once we were in the watershed of the Ituri. Eventually the tire was back in place, and we were moving east, but the sun was dropping quickly behind us. Darkness comes with little prelude in the tropics; we were just beyond Bafwasende, a small clutter of mud and wattle huts represented by a bold black circle on the Michelin map. It was a bad stretch of road, even now, in the dry season. John flicked on the headlights. Instead of two bright beams there was only a dull red glow. Three kilometres later, on a particularly steep stretch, the car coughed and despite John’s rapid downshifting gave up. John turned the key, nothing happened. Dead battery. We had just begun to think about how we would spend the night, how far away was the last village where we could get water to drink and maybe some food, when a 5-ton, compact Mercedes truck roared up behind us. This was the truck of the Zaïrian roads; bad roads breed brotherhood. The chauffeur, from Goma, assessed our situation and took charge. He was probably of Somalian origin, thin, tall of light brown complexion and Aryan nose. He yelled a brief command in Lingala to one of his ragged and road-wise companions, who, with speed, extracted one of the trucks large bulky batteries. Their battery was hooked up to our little Toyota engine and our discharged battery was back in the truck. “You’ll be fine”, he said. “I’ll get my battery up ahead at Niania” He shrugged and laughed at our repeated thanks as though such small things happened all the time. Of course he would help. The chauffeur rolled backwards as the engine rumbled, slipped into gear and carefully inched around us pushing branches aside with broad fenders. John started our motor and flicked on the now-bright headlights. We traveled together the remaining 60 km to Niania, another small concentration of mud houses and small cement block shops. John ate with gusto at the open-air truck stop and fell into bed, in a hotel room the size of a walk-in closet. Only half undressed, he was asleep instantly. Sarah and I curled up on the other narrow mattress. I blew out the kerosene lantern and was surprised suddenly to find morning light streaming under the door and roosters crowing. 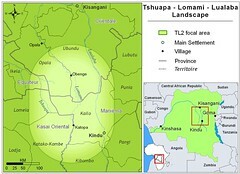 Our chauffeur friend had already returned our battery, taken his and traveled on towards Goma. We arrived in Epulu at midday. We sputtered up out of the forest to the village opening on a ridge-top. A few buildings lined each side of the road, including more truck-stop restaurants. We noticed immediately two Mbuti Pygmy women carrying firewood to one of the restaurant’s fires. Barely 2/3 of my height, these women were definitely strong. The loads on the ground would have reached their waists. Standing next to our car and looking back I could see that for the last half hour we had been following a ridge through the forest. From the village crest, we had a rare overview of the forest and its close-packed, undulating canopies, first green then gray to the horizon. Several trucks had stopped in town although our friend, the chauffeur from Goma had continued. Men clustered around a few tables intent on meat and bugali (a stiff cassava porridge). Each tore off a portion from the mound of bugali in the middle of the table, fashioned it into a rough dipper, and scooped up the sauce. There were no more than three tables at each restaurant. We wandered to the far side of the hill-top. The road dropped towards the east and the Epulu River where white water leaped beneath the bridge. We were next to the restaurant, “Démarreur”. The proprietor and his wife next to him were grinning a welcome to us. We smiled back. Sarah, whose stomach still wasn’t right, needed an outhouse, and it was lunch time. The roads are a clear gully through the forest on this 1990s satellite photo. The proprietor, Muzanga, asked John expectantly, “Are you coming for the station? Are you the new Warden?” The Parks Institute in Kinshasa had indeed sent a message. We were expected. My lingering anxiety vanished and we were all suddenly quite hungry. The meal of bugali and beef seemed sumptuous. John and I laughed and chatted with Muzanga. Another child, even younger than Sarah, peered around the door jam. Sarah said her word of Swahili, “Jambo”, repeating it several times as she won giggles from the little girl. On his head, Muzanga wore a small Moslem cap that identified him as a Mungwana, from a southern tribe associated with the Arabs on their ivory-seeking sweep through the forest a century earlier. The Wangwana had adopted a version of Islam, but stayed behind when the Arabs were pushed out by King Leopold’s men. We later learned that Muzanga had close to 20 children and eight wives. The young woman at his side was the youngest and current favorite. The bold youngster was her daughter. She darted a bit closer to Sarah, grinning invitingly. From her mother she ran to cling to her father’s legs without ever taking her eyes off Sarah. After lunch, we climbed back into the LandCruiser to coast the short distance down the hill toward the Epulu River, past a last few mud and wattle houses, a tiny church with a slanting cross on its roof and a single row of guard houses. 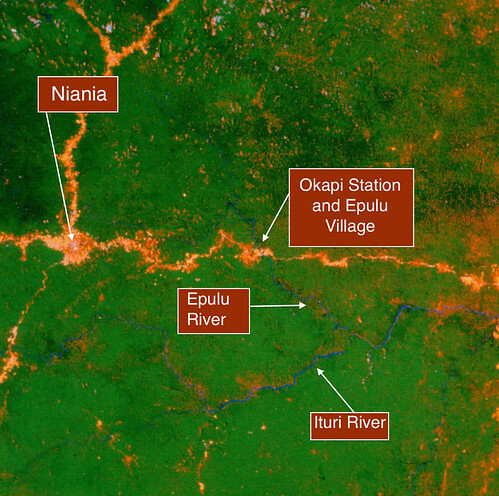 The station was there on the banks of the Epulu River. The warden, Palana, was away but his second in command, Kita Lema, gave us one of the three colonial houses, a large ramshackle structure near the bridge, over the rapids. It seemed like heaven to us even though half of the windows were broken, and only a few ragged curtains remained. Wasps of a great variety of colors, sizes, and shapes were busy fashioning mud nurseries on the walls, the doors, and even bare wires where they jutted here and there from holes in the plaster. But the walls were thick and the ceilings high; even at midday the house was cool. It was ours. We could make it our own. Immediately we set about turning the building into a home. Bring in the suitcases, bring in the bag of Sarah’s toys and the box of books, search for the medicine kit. It was Sunday. We had to take anti-malaria medicine, chloroquine, our “white” pills. As usual John and I swallowed ours, smiling, insisting to Sarah that it could be done easily: See how we set it on the back of our tongues, and swallow quickly? Then we drink water. All with a smile. A spoonful of sugar was ready. But the bitter half-pill was spit out full force with head-shaking wailing fury. It did not taste any better than last week. We resorted to captive animal techniques: force. But Sarah recovered quickly and was singing refrains from Old McDonald even before I had the medicine kit put away. We all went out to sit on the verandah steps. We listened to the river’s roar and watched it leaping among the rocks. This beautiful place would be home for a long time. It was nearly the same time of year, nearly three decades earlier, that Colin Turnbull came to Camp Putnam for the first time: April 1951. He came by motorcycle, from the east, with a friend, Newton Beal, on the seat behind. The forest towered on both sides of the newly cut road. The Belgians had put in the bridges and cut the connecting tracts in the 1940s. The previous foot route was abandoned. Fifteen years before Turnbull, that foot path had been walked by Patrick Putnam, an explorer and settler. Forty years before, it had been walked by Cuthbert Christy, an explorer-naturalist, and sixty-five years before by Henry Stanley, explorer and empire builder. Before that the foot paths had served the Arab slavers, but then as now, and far earlier as well, there also existed a much finer, more dissected network crisscrossing the elephant and buffalo paths, the footpaths between the sparse and remote camps of the agriculturalists, Lese, Bila, Lika, Bali, and Bombo, with associated camps of Mbuti and Efe Pygmies. The Arabs trading through Zanzibar were the first of the exploitative invaders. They saw the forest’s wealth, particularly ivory, as something to make them rich elsewhere. The forest was not a home. They invaded a sparsely populated land of kingdom-villages that were themselves frequently moving. After the Belgians pushed out the Arabs, the colonial administrators required all villages to re-settle by the roads they cut through the forest. When Turnbull came these villages seemed small and insignificant. Villagers had just started felling small clearings for gardens by the roadside. Turnbull knew of Putnam’s hotel. Planning only to spend the night, he and Newton Beal turned in at the sign. Patrick Putnam’s mud-walled and gracious hostel was an open door to another world and Turnbull was enchanted. They spent two months. Putnam was Colin’s match in enthusiasm and eccentricity. Anne Eisner, Putnam’s wife, and certainly Newton Beal, Turnbull’s friend, were both present, but it was Putnam’s animated accounts that entranced Turnbull and kept the kerosene lanterns lit late into the night. Both thin and tall, they might have resembled each other, but Colin Turnbull was young and vigorous whereas Patrick Putnam was now living from his chair, bound by emphysema. His eyes burned from deep sockets, his beard was grizzled. Perhaps he knew that he could not live much longer. Perhaps he hoped to inspire this young man to write what he, himself, had not. Realizing that Colin had the ear and sensibilities of a musician, Putnam encouraged him to study and record Mbuti song. The Mbuti Pygmies often sang and danced near the hotel in the evening but Putnam exhorted Turnbull to go with the Mbuti into the forest to hear their “real” music. Colin went and was enthralled not only by the music, but also by the simplicity of the communal life and easy open friendship. He wanted nothing to do with the village. Kenge, one of the Mbuti teenagers who had grown up in the protection of Camp Putnam, attached himself to Turnbull as cook, bodyguard, and chief informant. He was eager and proud; temperamentally the two were a match. Kenge was bright, exceptionally so. His quick expressive eyes had taken in the intellectual and foreign world at Putnam’s hotel and yet he remained on the edge, an outsider, most at ease as interpreter of one world for the other. He wanted to be master of both. The inquisitiveness of Turnbull was a license and orientation for Kenge. He was expert with the bow and arrow, with the hunting net, at tree-climbing and at story-telling. In his mind he held names of plants, names of people, paths through the forest, and the course of streams. But he wanted something more, perhaps a recognition that reached beyond the confines of Epulu and local Mbuti. Kenge also held resentment towards villagers in Epulu, particularly those recently arrived and associated with the new okapi capture station upstream from Camp Putnam. Kenge’s resentment fit well with Colin’s own desire to not get caught up in the obligations of Camp Putnam and village life. Kenge’s vulnerability was liquor, locally distilled liquor made from sprouted corn and fermented cassava, called kindingi. The brew, which he could buy with earnings from Turnbull, unleashed his tongue. He would strut confidently to the back of a village house, to the kitchen building where there were bottles of kindingi. He was handsome. He was confident. When Turnbull knew him, Kenge was young, energetic and lithe. Several villagers, slightly tipsy already, sat around. They called a welcome and pulled up another stool. Kenge started by buying an additional bottle for them. Before the evening was over, to pay for his excesses, he might have sold his shirt or new shoes acquired from Turnbull. “No problem. I can get more”. His pride was bared. There were good-humored, but mocking smiles. After all he was just an Mbuti. Kenge did not bear these slights well. His alcohol-confused brain recognized the jest. Was it that he should be recognized as different from most Mbuti? Was it that these villagers had no idea who Mbuti were? Or did he feel the villagers were jealous and wanted to deceive him? Or all three…? Within twenty-four hours of our arrival in Epulu, Kenge presented himself, “Mimi, Kenge. It is I, Kenge.” We stopped our cleaning and unpacking. Nearly 50, but still bright-eyed, agile and with a most generous smile, we were as certain as he was that he could help us get underway. John reminded him that he had been through Epulu before. Kenge remembered. We told him that we knew Colin Turnbull. Kenge was delighted. In the first few days of organizing ourselves we described for Kenge in a general way some of what we wanted to do in the forest. No problem. Easily done. Capture duikers to feed and weigh in captivity. Name and measure trees. Lots of Mbuti would be ready to help. Kenge’s confidence convinced us. 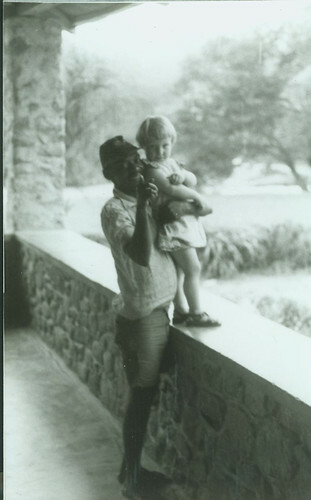 Kenge with Sarah at the Okapi Station, Epulu, in 1981. Kenge had a solution for every problem. He chose a cook for us, Basisionoko, a local Ndaka villager who claimed to have worked for wazungu (white people) but did not know how to boil beans. He was as congenial as Kenge and loved to play with Sarah. Kenge chose Kachalewa to scrub pots and chop wood. Another simple and cheerful soul, Kachalewa was half Bila and half Mbuti. We did not know it at the time, but he had been raised as an orphan by Anne Eisner Putnam. Coming to work for us was like coming home. With the three of them together, Kenge, Basisionoko, and Kachalewa, there was enough good cheer to make any problem insignificant. The damp smoky kitchen behind the big house reverberated with their explosive laughter. Station guards hung around to gossip. Sarah was drawn as a damselfly to water. At this time, because of Sarah, playfulness was more important than competence in anyone working for us. My research design set out elaborate plans for comparing forest plots, with measured trees and counted seedlings, but a first problem was leaving Sarah for even a very brief period. A second problem was that I could not tell one tree from another and there were no field guides. So initially Kenge and I took only short introductory walks of an hour or so from the station. I would stop to look at a small tree. Kenge would immediately tell me the Kibila name, he would look around and perhaps find another example of the same species. He would reach up, break off a branch and point out an interesting color pattern or insect gall. Then he would repeat the name slowly while I wrote it down. Something had been accomplished and he smiled broadly as though my writing it down assured his immortality. Kenge understood from my first questions that the seedlings and saplings were as interesting as the large adult trees. At any tree whose bark we stopped to examine or whose buttresses we stopped to admire, he would look around for seedlings. He would offer his own precious natural history observations. “No, this mother tree does not walk with her children.” So I would write down that it was probably not shade tolerant, probably regenerated only in treefall openings or larger blowdowns where the sun shone on the forest floor. I was overwhelmed. There were so many different species of trees and no manual to teach scientific names or geographic ranges and life histories. I was on my own in a forest vastly more complex than anything I had imagined. Our woodlots back in northern USA were a poor preparation. And Kenge, though able to uncover the anthropologic information Turnbull needed, could not help me move from his own local botanical nomenclature to a scientific taxonomy. In the meantime, the care of Sarah remained the most pressing unsolved priority for both John and me. Sarah wailed heart-wrenchingly when John and I left in the mornings, me with Kenge, John to near-by hunting camps to record and weigh the catch. Sarah, not yet three years old, needed a responsible companion. We first tried two local sisters, Annie and Tomo. They were awkward and mainly interested in the station guards. Sarah never took to them at all. We tried a Mubudu girl, Andea, whom we brought in from the Mambasa mission 70 km down the road. 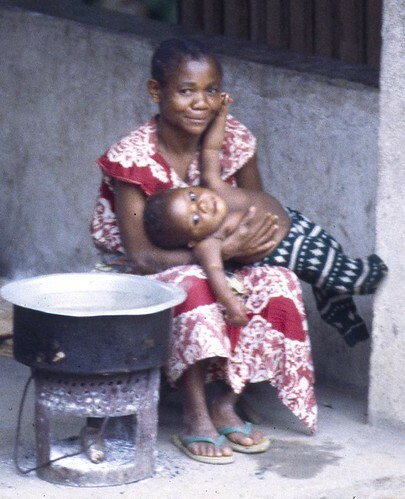 She lived in a room by the kitchen, but Sarah’s main caretakers remained Basisionoko and Kachalewa. After a couple of months and suspicious that she was pregnant by one of the station guards, we returned her to Mambasa. Kenge recommended Sofi, a lively Mbuti woman, as replacement for Andea. Sarah was won over immediately. Sofi gave Sarah her full attention and yet was quick to learn what John and I wanted. She was not more than four and a half feet tall, with a winning half-smile like a permanent light on her face. It did not matter that she had something of a “tarnished” reputation after a series of liaisons including one with a village man. Sofi had no pretenses, and no girlish flirtations. When John and I were back and dusk approached, she’d catch Sarah in her arms, Sarah already almost half her size, they would share some joke; then she’d put her down, smile at us hesitantly, laugh out loud and run up towards the village. Sofi with a child in our kitchen. In some ways Sarah was the quickest to assimilate her surroundings. Sundays we stayed in town. Not more than a few weeks after arriving, I realized how Sarah’s world had changed. A Sunday afternoon on the stone verandah, I had a book open on my knees, trying to learn the distinguishing characters of tropical plant families; John was fishing just upstream and Sarah was taking care of her wooden-headed doll on the step near me. I stopped to listen to her chatter. “He’s very sick. He didn’t take his white pill,” she said wrapping the doll in a handkerchief. “He can only eat maji ya sombe,” she cooed in vocabulary which must have come from Basisionoko in the kitchen. Then she started singing nonsense with a distinctly Swahili intonation, imitating the chanting we had heard that morning at the small Catholic chapel in town. This entry was written by Terese Hart, posted on 2014-06-20 at 6:42 pm, filed under Ituri Story_memoire. Bookmark the permalink. Follow any comments here with the RSS feed for this post. Post a comment or leave a trackback: Trackback URL. What a great story, and wonderfully written ! looking forward to more ; ) hope you and John are well and look forward to seeing you soon. What a great surprise to find these stories on your blog! I’ve been waiting for your written stories since I first learned about your work back in 1994. As always, thanks for sharing!